What Do Viruses, Trojans, Worms and other Malware Actually Do? While there’s plenty of talk about viruses, trojans and cyber-security in the news, it can often be hard to know what exactly people are talking about. In this article, we’re going to be looking at the various types of viruses, malware and more, as well as what they can do, how they work and how best to protect yourself and your computer. The term Malware – a portmanteau of “Malicious” and “Software” – refers to all software designed to harm your PC or steal your information. While “Malware” and “Virus” are often used interchangeably, the two mean entirely different things, as Malware is a general term. Viruses, worms, trojans and exploit code are all types of malware, so while it can be said that viruses are malware, it isn’t accurate to say that a malware file is a virus. One thing to keep in mind is that a file or program must be malicious in intent to be considered malware, and buggy code or exploitable software cannot be considered malware. A virus is a program designed to spread from file to file and PC to PC when files are shared, though they often vary a lot in terms of spread, harm and intent. Most viruses are attached to executable files (.exe), but some can target a master boot record, autorun scripts MS Office macros and more. Much like a biological virus, computer viruses spread from one file to another, and can infect other PCs when files are copied or shared. Some viruses exist only to grow and spread (often slowing your computer in the process), but others contain malicious code which affects your files, operating system and even master boot records, which can prevent your PC from booting at all. However, viruses can only spread with action from a user, such as downloading infected files or running the program manually. Many viruses are attached to executable files, as users are more likely to run it, unleashing the virus in their computer. By double-checking all files coming into your computer (by email, downloads and otherwise) you can avoid many viruses, though other precautions may be necessary. Ensure that all the files you download or install are from trusted sources, and use the latest anti-virus software to best protect yourself and your computer. Worms are similar to viruses in that they can replicate themselves and cause damage PCs or systems they are present on. However, worms differ to viruses in one major way; worms are capable of replicating and spreading without human interaction, making them harder to track and prevent. Computer worms use networks to replicate themselves across multiple PCs, often using a security hole to ‘tunnel’ to travel from one host to another without user intervention. Because they spread rapidly across networks (sometimes without users even noticing), worms are extremely dangerous, and can cause millions in financial damages. Because computer worms are mainly network-based, strong antivirus software and firewalls are needed to protect against them, as well as user caution when downloading attachments or clicking links. Like the mythical Trojan Horse which was used to transport armed soldiers into the city of Troy with subterfuge, Trojans appear to be beneficial, but harm your computer and/or steal valuable information. 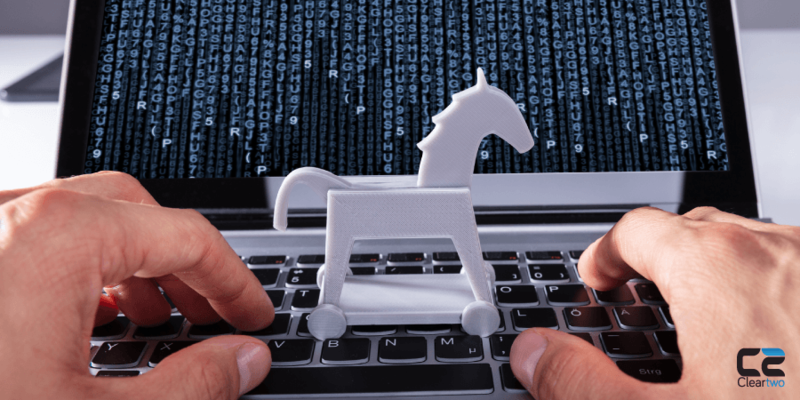 The main goal of a computer trojan is to cause damage or create a backdoor to your computer that allows it to be controlled remotely. However, they cannot spread like a virus, and require users to install or download them manually, often through deceit, hence the allusion in the name. Trojans are either planted somewhere they are likely to be downloaded (e.g. by posing as a free program) or sent directly, often via email. Once your PC has been infected with a Trojan, it may be used for nefarious purposes by a hacker, or damaged by the trojan. Whatever the nature of the trojan, you can protect against them with the same protective measures that you might use against viruses: ensure that your antivirus software is up to date, don’t open suspicious files and only download files from trustworthy sources. Spyware, as the name might suggest, is intended to spy on your computer, collecting data such as passwords, browsing habits and sensitive information. Unlike other types of malware, spyware doesn’t directly harm you or your computer and is often intended to spy quietly in the background to gather data covertly for longer. Because of spywares covert nature, many people who have been infected aren’t aware of it! Also, not all antivirus software is designed to catch spyware, so check with the seller to ensure that it can protect against all types of malware. In conclusion, common sense is king – be cautious about what you let into your computer or system, and if something sounds too good to be true, don’t download it – and a good antivirus program is essential.